Contemporary Indigenous art is a growing element of Griffith’s Art Collection and will continue to be a purchasing priority in years to come. Indigenous artists featured in our collection include Tracey Moffatt, Richard Bell and Gordon Bennett, and works come from remote communities such as Papunya, Kayili and Yuendumu. 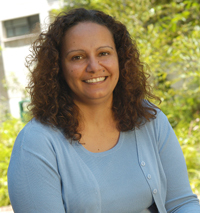 Miara Watson designed the artwork for Griffith’s reconciliation statement in 2007 when she was a first-year Bachelor of Contemporary Indigenous Australian Art student at the Queensland College of Art. The watercolour print called Gari - The Sun, symbolises a new day, a bright future, healing, cleansing and strength. “There are many pathways leading to the centre—these represent the different backgrounds, lives and origins that Australians take to reconciliation," Miara says. Miara is a Gooreng Gooreng woman who was raised in a family of artists in Brisbane. 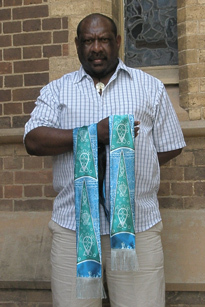 Culturally unique graduation stoles were designed following extensive community consultation, and graduates have the option of wearing an Aboriginal and/or a Torres Strait Islander design in conjunction with academic dress. Deann Grant, a secondary art teacher and Aboriginal woman from the Kuku Yalanji Language Group in far north Queensland’s Daintree Rainforest, is the artist behind the design of the Aboriginal graduation stole. Featuring red, yellow and black - the colours of the Aboriginal flag - Deann says the stole was based on the theme of From Little Things Big Things Grow. The design’s red section represents the small beginnings each student makes when they start at Griffith University. “This is represented as a seed, which then blossoms into a long journey captured in lines,” she explains. Deann says the black section of the design is to “remember where you come from and the connection we have with our traditional land; this is represented in the form of rock art”. The images of hands within the design depict the individuals making their mark on the university, while the coolamon represents women's business, hunting and everyday life. The message stick, another culturally significant implement featured on the design, represents the safe journey made to and from studying on traditional land. The design also features a boomerang, which signifies men’s business. “It's a throwing stick that can be used for a variety of purposes but in this design it represents the return effect one can make if they wish to return to study,” Deann says. Mab Neseurm, which means journey to the stars, is a representation of the struggles each student faces as they strive for their goals and to succeed at Griffith University. “Once the students accomplish their goals, they will then be able to bring their knowledge back to their home communities or further their dreams to success,” Eddie says. The design depicts a turtle’s lifecycle and how its struggle begins from the day it’s born. Once a turtle hatches, it makes its way to the ocean, trying to avoid predators such as goannas, pigs and birds. The surviving turtles then face fish lurking in shallow waters, strong currents and the treacherous reefs before reaching open waters. In Eddie’s design, the patterns represent the strong currents and the arrows represent the direction of success synonymous with students as they enter university. The Dhari and star at the top of the stole is symbolic of students reaching their goals. “The Dhari is culturally and symbolically significant for Torres Strait Islanders—it signifies unity to our people—while the star plays a significant role in our lives,” Eddie explains.